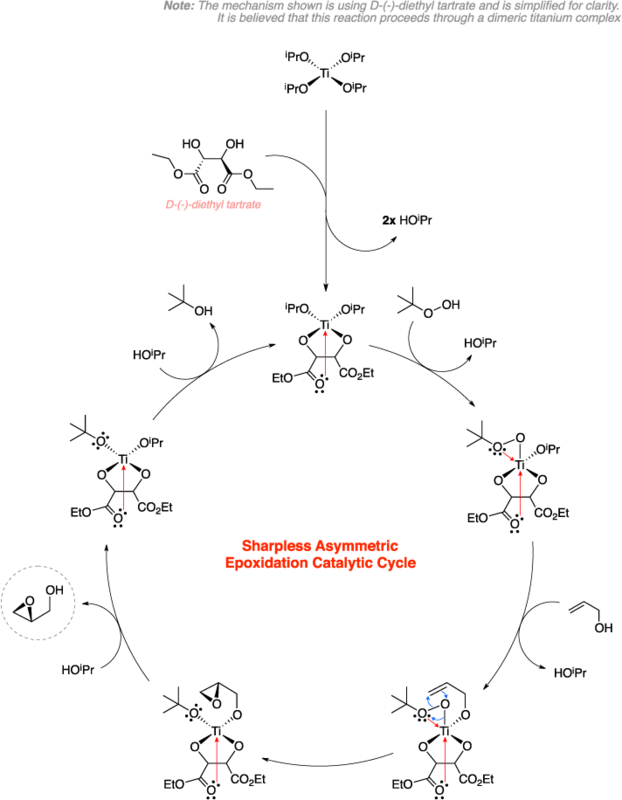 The Sharpless epoxidation is an organic reaction used to steroselectively convert an allylic alcohol to an epoxy alcohol using a titanium isopropoxide catalyst, t-butyl hydroperoxide (TBHP), and a chiral diethyl tartrate (DET). The mechanism begins with the displacement of the isopropoxide ligands on the titanium by DET, TBHP, and finally by the allylic alcohol reagent. This titanium complex is believed to exist as a dimer, but for simplicity is shown as a monomer in the mechanism. 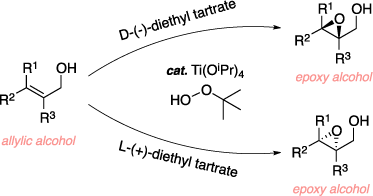 Oxidation of the olefin with TBHP then occurs where the chiral DET dictates the face of attack and leads to a steroselective epoxy alcohol. Katsuki, T.; Sharpless, K. B. J. Am. Chem. Soc. 1980, 102, 5974–5976.